This article was written by Yurdi Yasmi, Forest Policy Officer for Asia and the Pacific , FAO and Soojin Kim, Programme Officer, Sustainable Environment and Nautral Resources Management, FAO and was originally posted on FAO InFO News. 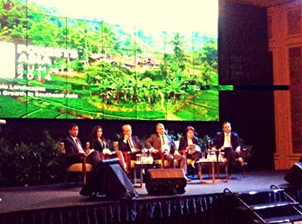 The Forests Asia 2014 Summit opened on 5 May in Jakarta, Indonesia, with a keynote address by the President of Indonesia, H.E Susilo Bambang Yudhoyono. Over 2 000 delegates, including ministers from across Southeast Asia, corporate CEOs, environmental and civil-society leaders, youth, development experts and some of the world’s top scientists gathered for two days of discussions and knowledge-sharing on how to accelerate the Asia region’s shift towards a green economy through the sustainable management of its forests and landscapes. A discussion forum organized by FAO on the theme of equitable development – sustainable landscapes, green growth and poverty reduction provided a platform to highlight the role of forests and sustainable forest management (SFM) in the green economy and poverty reduction. The Summit was organized by the Center for International Forestry Research. Over the past several decades, Asia has been a powerhouse of economic development and is making significant progress in achieving Millennium Development Goal targets. This impressive growth, however, brings with it tremendous environmental and social challenges. The region has an urgent need to balance economic growth with social equity while significantly reducing environmental risks and ecological scarcities. Achieving this balance requires close coordination among all land-based sectors. A landscape approach is therefore critically important. FAO’s discussion forum sought to identify the ways in which Asia’s forests are progressing towards a green economy, as well as the opportunities and challenges that they might face in coming decades as it strives for green growth. Yurdi Yasmi, Forest Policy Officer, FAO RAP, opened the discussion forum by setting the scene and summarizing the main achievements of the forest sector towards greener forestry and sustainable landscapes. “Sustainable forest management practices have a lot to offer to green-economy and sustainable development goals,” he said. “Experiences from assisted natural regeneration and leasehold forestry projects, for example, demonstrate how these interventions contribute to effectively achieving social, economic, and environmental objectives.” Yurdi further described three key opportunities that can support green-economy objectives through forestry: promoting sustainable practices in forestry, expanding natural assets and creating forestry jobs. Dr Hadi Susanto Pasaribu, Executive Director Association of South East Asian Nations (ASEAN)–Korea Forest Cooperation (AFoCO), introduced an evidence-based case from the Republic of Korea on how the sustainable landscapes approach supported by grassroots movements can benefit green growth in Asia through multistakeholder collaboration. Can the benefits of green investment be shared in equitably? Responding to this question, two private-sector representatives shared their vision on how business can contribute by creating incentives and benefits both in quantity and quality for concerned stakeholders. Mr Adam Grant, Manager of Investments and Operations for New Forests Asia, put the spotlight on forest landscape management in Asia and the potential for creating incentives for business and investment. “The forestry sector in Asia is changing rapidly and the institutional investors are looking closely into emerging markets in South East Asia as part of their diversified portfolios,” he said. He noted that a key challenge for private investors is how to engage effectively with smallholders, where issues of tenure and risk are greater. In line with this, Mr Bruno Cammaert, Forestry Officer FAO, indicated that there seems to be an incompatibility between private-sector and smallholder modes of operation. While this may pose challenges in terms of building strategic cooperation between them, there was nevertheless a need to find ways to ensure that smallholders can be assisted in order to take advantage of the opportunities provided by green growth. Dr Doris Capistrano, Senior Advisor of the ASEAN–Swiss Partnership on Social Forestry and Climate Change (ASFCC) and Senior Fellow at the Southeast Asian Regional Center for Graduate Study and Research in Agriculture (SEARCA), reflected on the implications for ASEAN countries of the key points arising from the preceding discussion. In the process of creating the ASEAN Economic Community, she said, “ASEAN countries individually and collectively have a unique opportunity to move towards a green economy based on sustainable, multiple-use landscapes. This requires transformative policies at all levels, cross-sectoral and multistakeholder collaboration, the re-imagining of the face of the private sector to more centrally include small and medium-sized businesses, and achieving greater equity in the distribution of benefits across the value chains”. Enlightened corporate players can assist in this transformation and stand to benefit through reduced risks to investments and reputations and an improved bottom line, she said. Processes and mechanisms already exist within ASEAN that can facilitate this transformation. ASEAN’s Multisectoral Framework for Climate Change: Agriculture and Forestry Towards Food Security is a cross-sectoral mechanism, which although still in the early stages of development can potentially play an important role. The discussion forum concluded that forestry has enormous potential to contribute to green growth and green economy goals and targets in Asia. Forestry alone won’t be able to tackle the economic, social and environmental challenges that need to be overcome to achieve these goals, but nor can such challenges be addressed without forestry as an integral part. Overcoming fundamental challenges such as land-tenure insecurity, conflicts, misaligned incentive structures, uneven playing fields for business enterprises, the low capacity of stakeholders, and inadequate policy frameworks will need to be prioritized to create an enabling environment for green growth. Forest management, in particular, needs to be contextualized and reoriented in a manner that more effectively and simultaneously supports green growth and poverty reduction. The vast store of knowledge and experience that has accumulated as a result of decades of research and experimentation with integrated rural development and the sustainable management of watersheds and forests provides a solid starting point for action. However, the realization of the vision of inclusive green growth can only be possible with strong and sustained action and commitment from all stakeholders, and committed leadership, especially from governments. creating enabling conditions that support green investment and at the same time enhance opportunities for poverty reduction.